Today was the last day you could just about everything (redeem codes, trade cards, dig, etc.) for the Topps Diamond Giveaway. I believe the one thing you can still do is request delivery until the end of July. I stopped biding my time about a week ago and went onto the site to take delivery of my cards. I didn’t realize how it worked, but I also had 2 “Factory sets” as prizes in my queue. I was wondering about those – for some reason I assumed they would be sent when I won them, then forgot about them. But they actually showed up when I went to redeem the other cards. Also, it ended up earning me free delivery, so that was pretty cool – I guess when you’ve won a prize, you get free shipping instead of the total rip-off if you have to pay (like 3 bucks first card, 50 cents each additional). I have quite the plan for these. I think I’m going to try to sell one set, but for the other I’ll try to sell some team sets and keep the box to put my 2011 base set. As mentioned, I also got some cards. Here they are, basically in chronological order. Naturally, the older cards are in worse condition. That McMillan would be pretty good if it wasn’t completely offset. 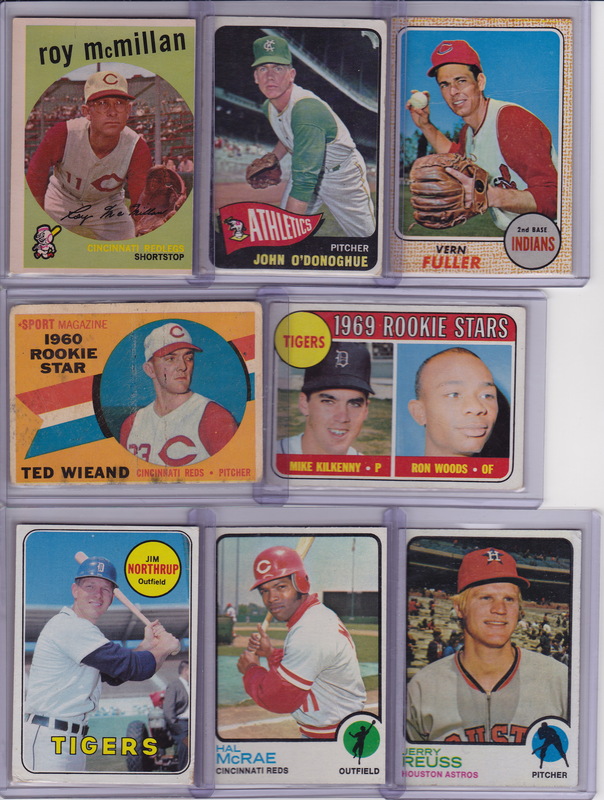 The McMillan and the other Red, the 1960 Rookie Stars Ted Wieand, were two cards I was looking forward to seeing. Too bad they’re in bad shape, but I guess that gives them “character”. 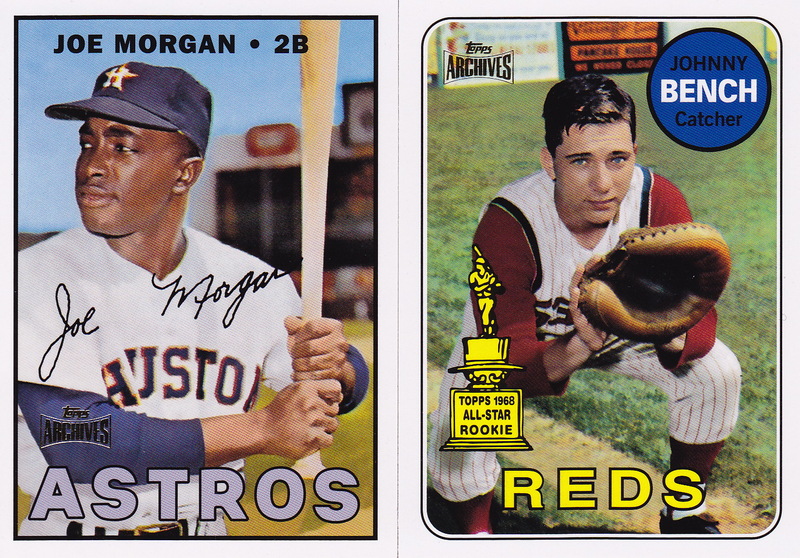 The McRae and Reuss from 1973 are pretty cool cards – I turned down a number offers for each of those cards. Next up, cards from the mid-late 1970’s. The 1975 MVPs with Ernie Banks was the one I got the most trade offers for, and now I wish I’d have taken the best one. It’s really in bad share. Not only are the corners beyond rounded, the card has a wax stain on the back. Oh well, what can you do. Overall, some nice cards here as I wrap up my 2011 Topps extravaganza. I had another stop by what’s considered my “Local Card Shop” (LCS) last weekend. Like series 1, I bought a jumbo HTA box, but still needed 4 more jumbo packs if I wanted to send in for the Gold Rush cards. 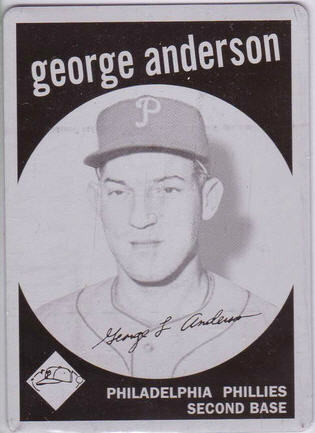 And, yes, I wanted to do so – thus I headed over to The Baseball Card Store in Midland Park (website here). No good story about fathers, sons and baseball card collecting like when I went there to buy some series 1 cards back in February, but I left happy as I always do! I got those 4 jumbo packs and picked up some supplies. As usual, they charged me a bit less than the total if I added up everything I was buying. I’ve never asked for this, but it happens every time I spend more than a few bucks – and it’s always appreciated and makes me much more willing to go back! Again – if you’re ever in Bergen county looking for a card shop – I’d highly recommend this one! As to what I got from the packs – here’s some of the inserts. A few doubles from my box, but a few new ones, too. 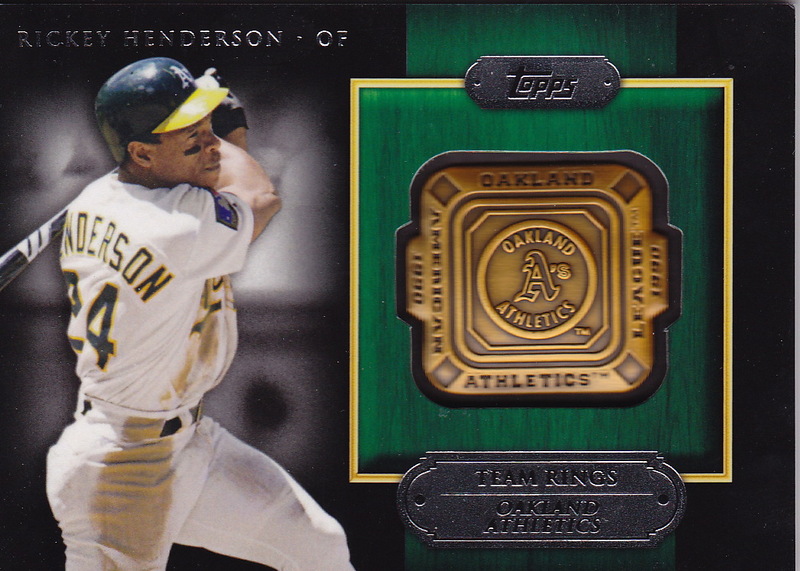 And a Rickey Henderson! Between Rickey and Griffey, if Topps could just get Eric Davis into this product it would be the trifecta of my favorite all-time players! I also got two “hits” in those packs. The first was nothing crazy – but a jersey of a good player is always welcome! OK, well, at least he was a good player before he signed a 100 million dollar contract! And finally, a manufactured relic. 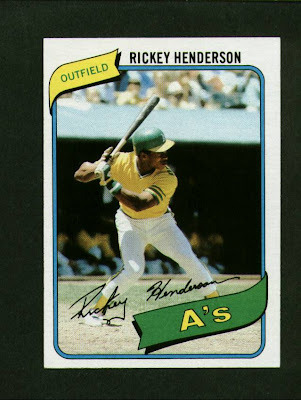 But a sweet manufactured relic – I mentioned Rickey above? Well here’s Rickey again!!! I’m gonna make this one a little larger just so you, me and the rest of the world can appreciate it – because this is definitely a keeper! 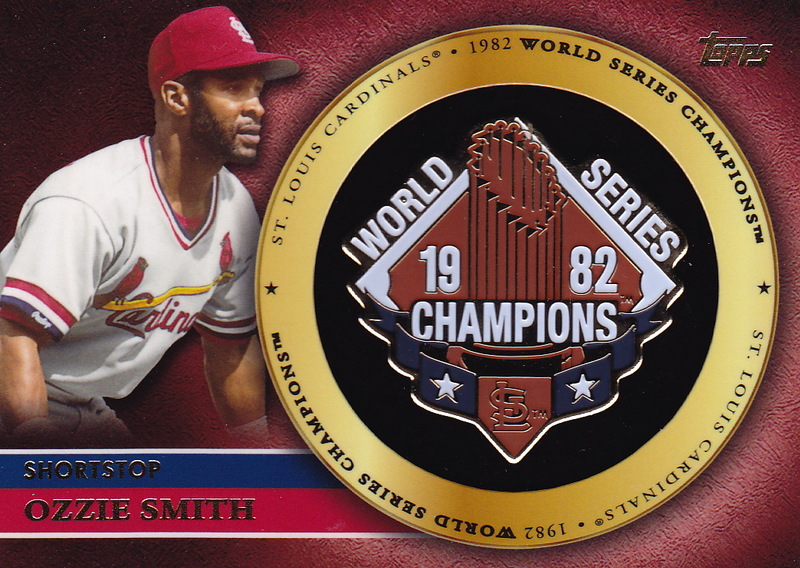 This was my first one of these, and they are much nicer than the World Series pins (which I like – so that’s saying something)!!! 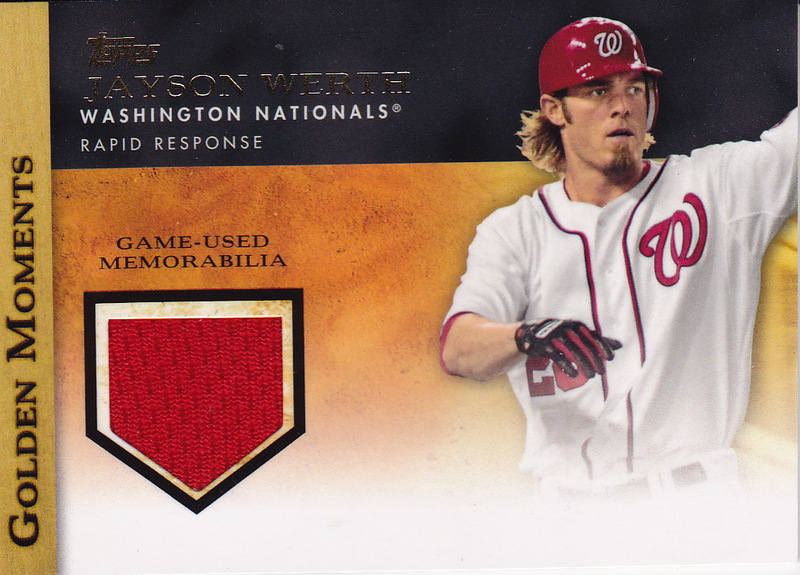 Base Topps is full of inserts. There’s actually a few less in series 2 than in series 1 – I got 55 non-parallel inserts in the HTA jumbo box – which is 22 less than the 77 I got in the series 1 box. Counting parallels and relics, that’s 69 inserts (compared to 90 in series 1). I’m not sure what I prefer – though I think there are actually fewer inserts to collect in series 2, so maybe that’s better. My absolute favorites are still the 87 minis, which are continued from the first series. I’ll repeat what I said in series 1 – 1987 was a love/hate set for lots of collectors. 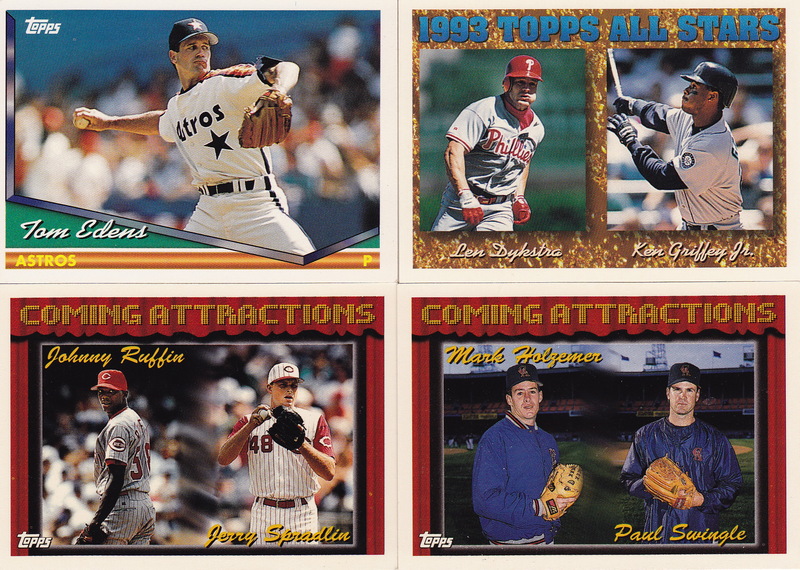 1987 was the first year I ever bought cards, and I sure loved those cards. I’ve said it many times on this blog before – but a new wood border design would have been the way to go for the base set for 2012. These minis are still a good nod, though! They only had current players in series 1 (which I liked), and I wish they’d have stuck with that. In series 2, the last 15 cards are retired players. I guess this is a way to get Mickey Mantle on another base Topps card design that he hasn’t been on before. There are a few new insert sets, and I like most of those new ones. 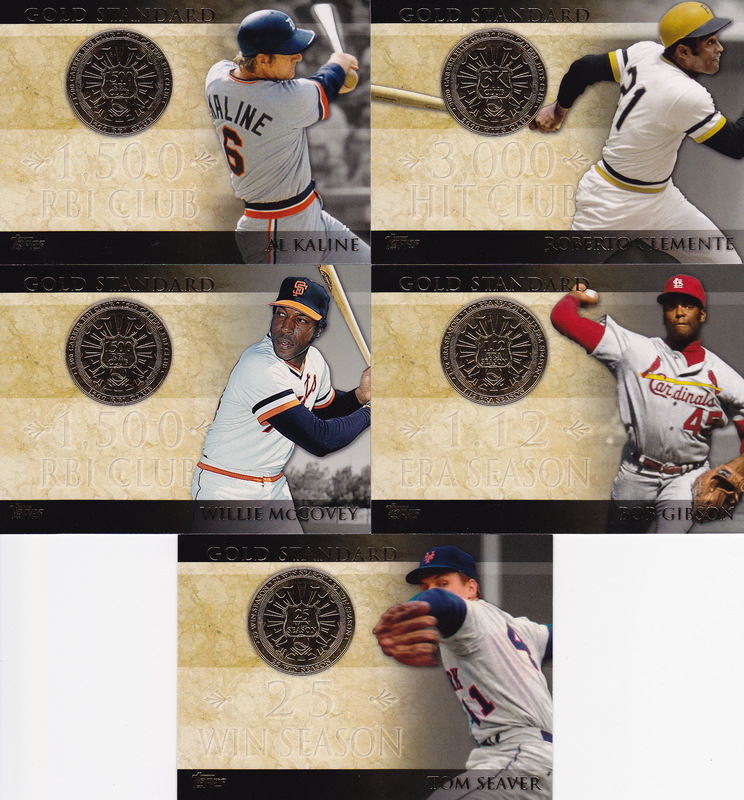 Some of them tend to be designed for relics, but, at least for this Mound Dominance set, it doesn’t look quite as bad. The area where the relic could go has a strike zone there – which goes well with this set. Plus, this has a lot of the things I like in an insert set – a standard theme that’s clear when you read the card and a good group of players that fits the theme. 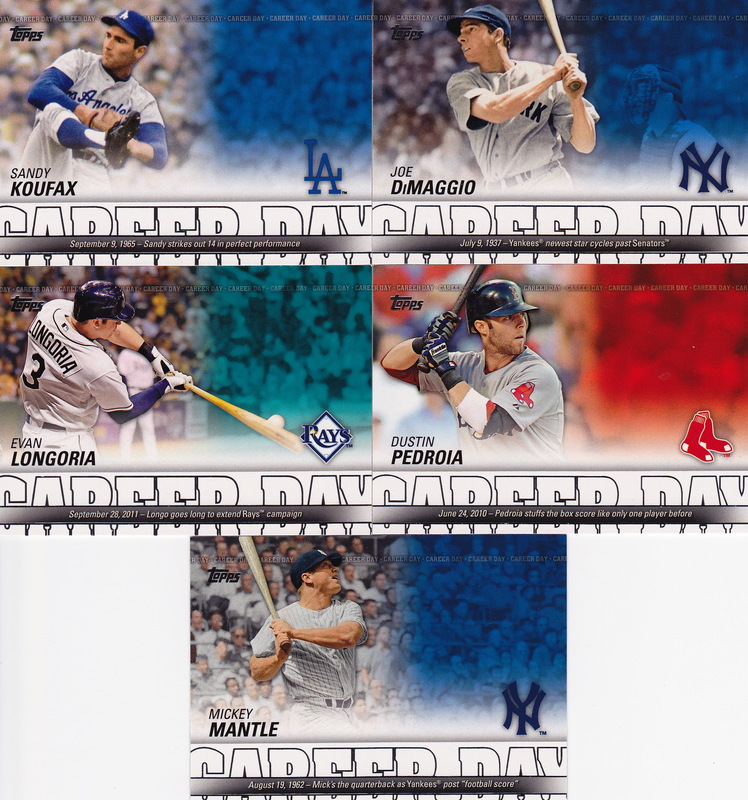 The second new insert is the Career Day set. These cards are a good (not great) design, but I again like the fact that they have a theme that they stick to – for a bunch of great players, cover their “career days”. 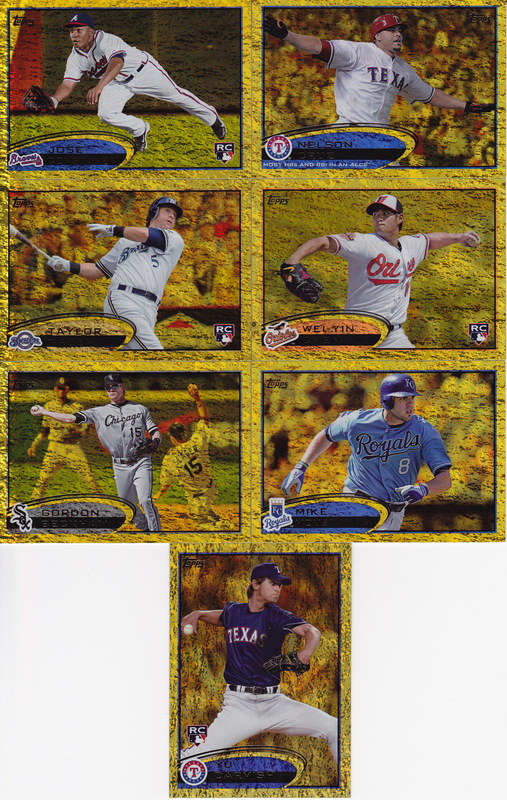 The last “series 2 only” insert is the “Cut Above” cards, which are the first die-cut cards from flagship Topps that I can remember in quite a while. I’ve read mixed reviews on these, but I like them for the most part. The die-cut is a little different from what I’ve seen, and there are some good names in there. Plus, I know there’s a Griffey in the set, though I obviously didn’t get that in this box. Other than the 1975 minis, the Gold Standard cards are the best returning inserts. Again, I’m always a fan of an insert set that actually focuses on something specific. You must have reached a pretty lofty milestone to get in this set. And it’s numbered sequentially from series 1, which is good, though it should be an automatic (see next paragraph). OK, so that reference was the Golden Moments cards. 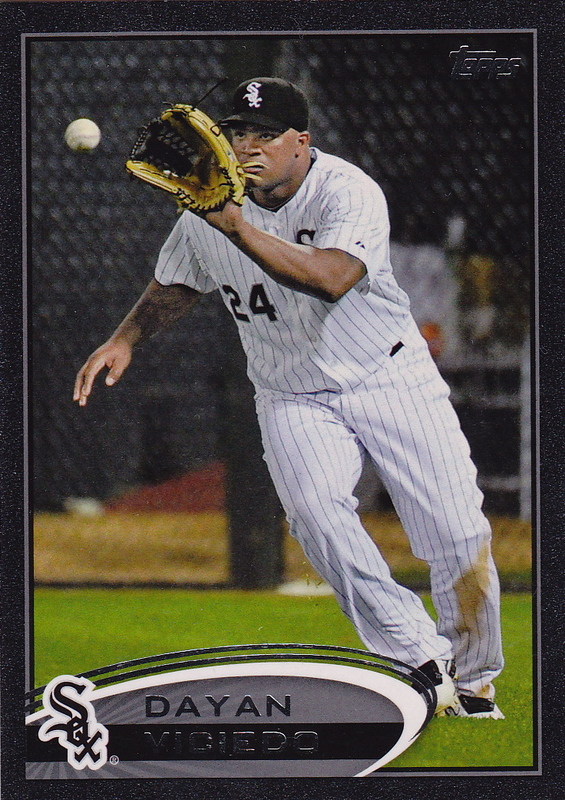 I liked that these are cards that highlight an actual moment in the player’s career, but Topps got lazy on these and just picks things like a game winning RBI. The design also isn’t my favorite – it’s clearly built to house a relic – too clearly. Lastly, and pretty importantly for a set collector like me, these things aren’t consecutively numbered from series 1 to 2. So there’s a card #GM-2 in series 1, and a card #GM-2 in series 2. I don’t know why they chose to do this – in fact, I’d be willing to be it’s just a mistake. It seems kind of like laziness if you ask me. Last (and least in my mind) are the Gold Futures. I just don’t love the design, though it’s grown on me a little bit since February. 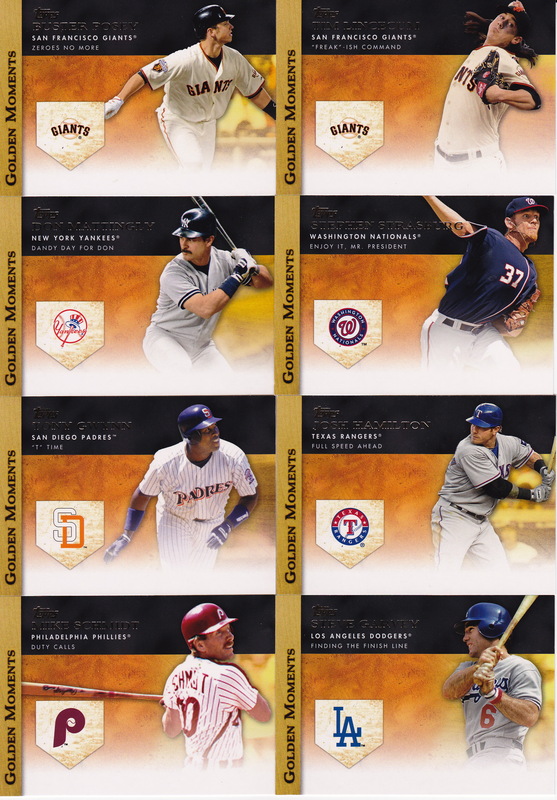 Still, these just look so much like some inserts Upper Deck did around 2007, and, like the Golden Moments cards above, they’re clearly designed to throw a patch on there. 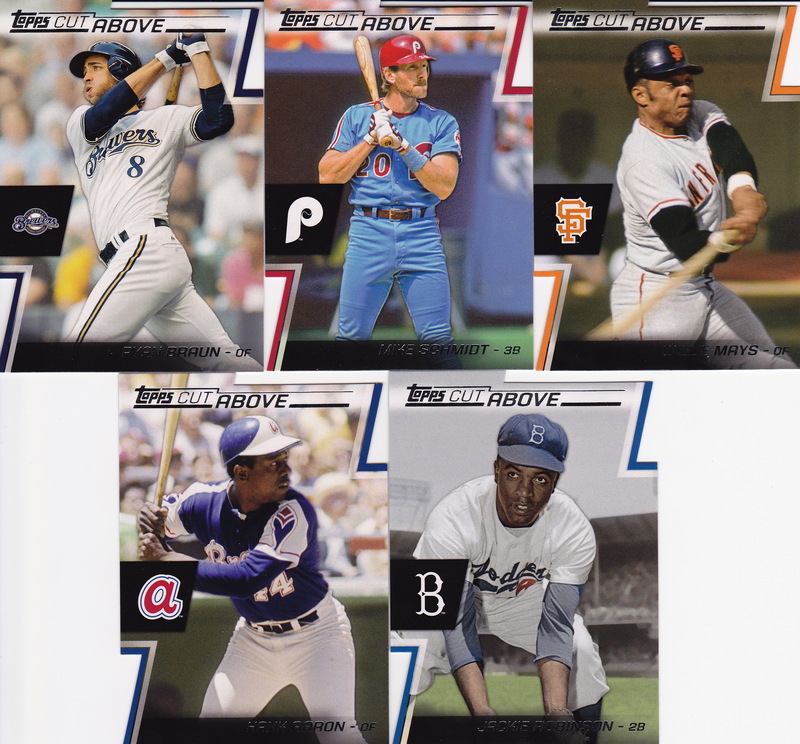 They aren’t awful, though, so if this is the worst insert set – I’ve got to give Topps decent marks overall! I also appreciate that these are numbered consecutively across the series, unlike the Golden Moments. Again, that should be expected, though. These are actually twice as hard to pull in series 2. 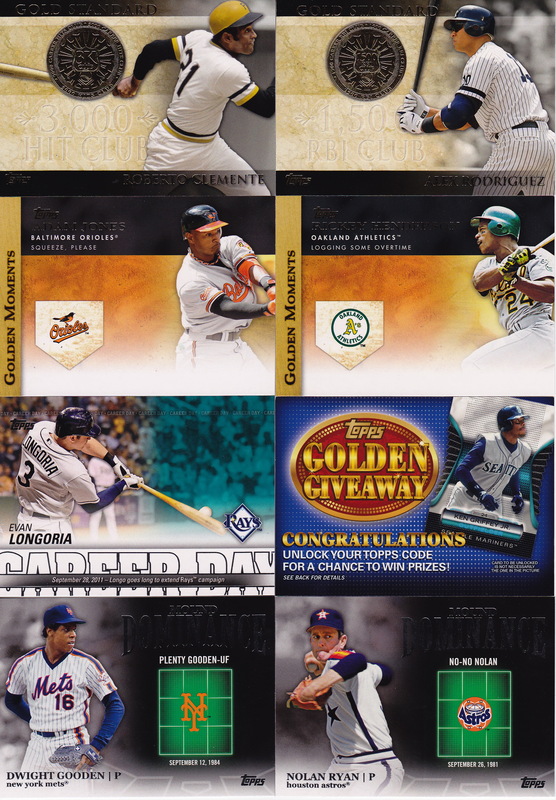 You get 1 gold parallel card per pack out of the jumbo box – so I got 10 of the “Golden Moments” parallel cards. 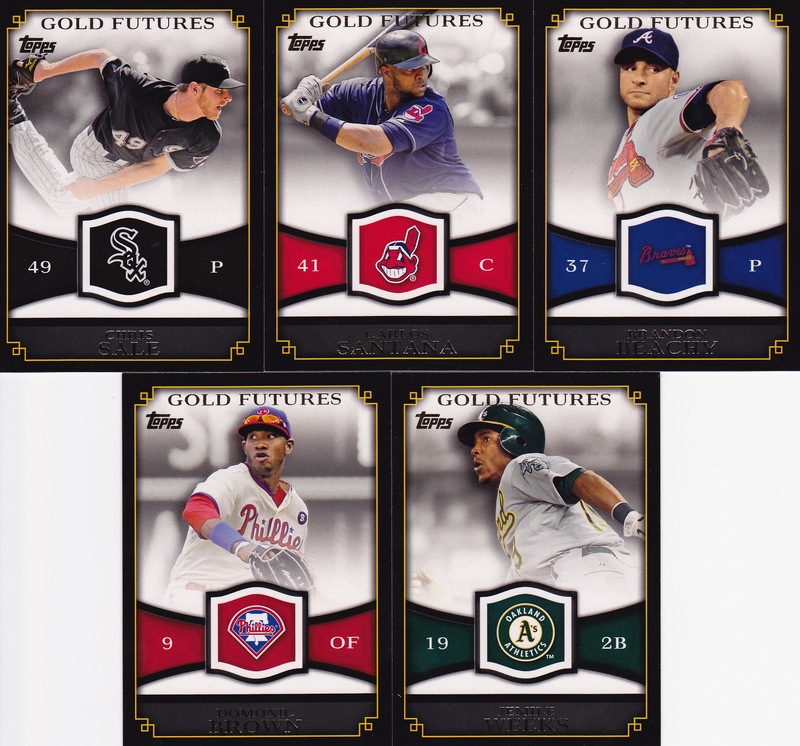 I had thought these just kind of replaced Topps Gold, but it sounds like Topps is going to put Topps Gold parallels of all 2012 cards (the 330 Update and the 660 base cards) into Update packs. I may go with a regular hobby box for Update – as the one thing I don’t want is complete parallel madness like last year’s Update box was. These come 1:4 in a regular hobby pack. I’ve said this before – but I think these parallels are an example of “going to the well” too many times, copying the Diamond Anniversary cards from last year. Especially true if they don’t replace Topps Gold. I was pretty happy to get a Yu Darvish parallel from this box. I also got a Topps Black parallel card. These are numbered out of 61 in honor of this being the 61st year of Topps base sets. 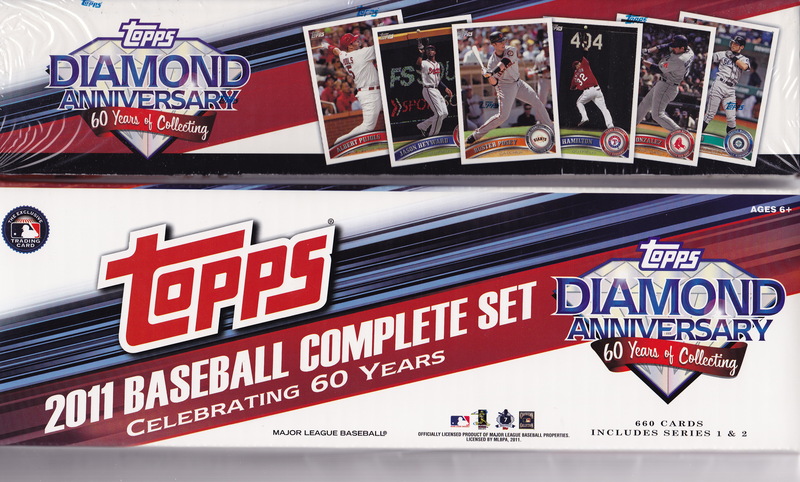 I finished up my Topps Archives posts two days ago, so I’m moving on to the next product I bought – Topps series 2. I’m quite a bit behind the rest of the blogosphere on this. But I had a great time doing my Archives posts, and I didn’t want to stop in the middle of those to do series 2. After ordering a jumbo HTA box early in the month, I finally got around to opening it over the weekend. I ordered the box from Atlanta Sports Cards, adding on a 2001 Topps Traded box for good measure (in other words, to get the free shipping). I believe that 2001 box is actually going to be my 2nd most expensive box of the lifetime Topps project, due to the Pujols and Ichiro rookies. In fact, I was kind of toying with the idea of just buying a couple of packs and trading for what I can. But this one was a decent price. But that’s for a later post (much later, considering I’m temporarily paused in between 1995 and 1996). This post is for that 2012 series 2 box. And this post is just the hits, ma’am! None of these were anything to shout home about – which is OK after the monster I pulled in series 1. But these are all nice cards. The first card was the 1 autograph from the box. 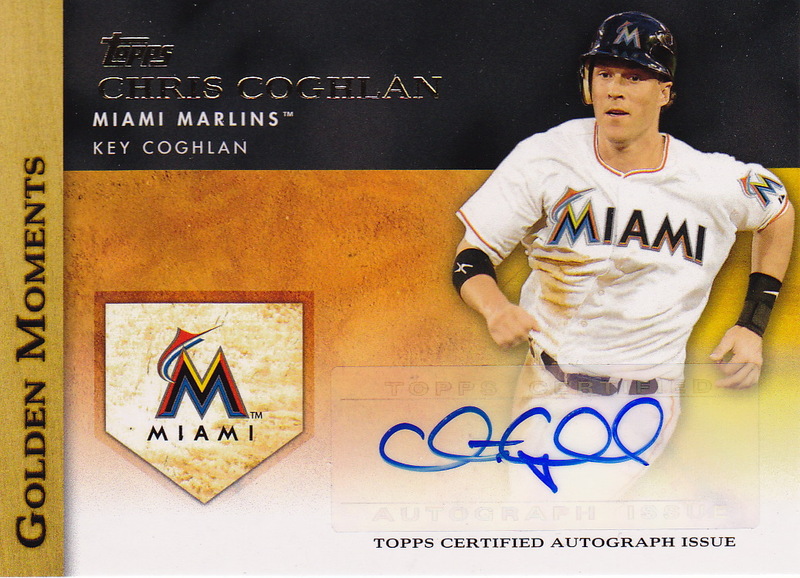 It’s Chris Coghlan from the Golden Moments insert set. I noticed they may have been running low on ideas for moments when I was opening the box. Don Mattingly ties the record 8 straight games with a home run? Chipper Jones gets his 1,000th extra base hit? How about Chris Coghlan picks up a game-winning RBI in a 2-1 game last May? Ummm … Check? I’ll skip ahead to the 3rd hit I pulled – I got a Jeter World Series pin in the series 1 box. Well, I got another pin of another all-time great short stop, though this one played for the other “evil empire” – the dreaded Cardinals! But as much as I don’t like the Cards, I have much respect for the Wizard, and this is a cool card. Again, I do like these cards, though I wish they’d have gone to the next level and matched the pins in the card to the actual press pins from each series. As is, they still do look sharp. 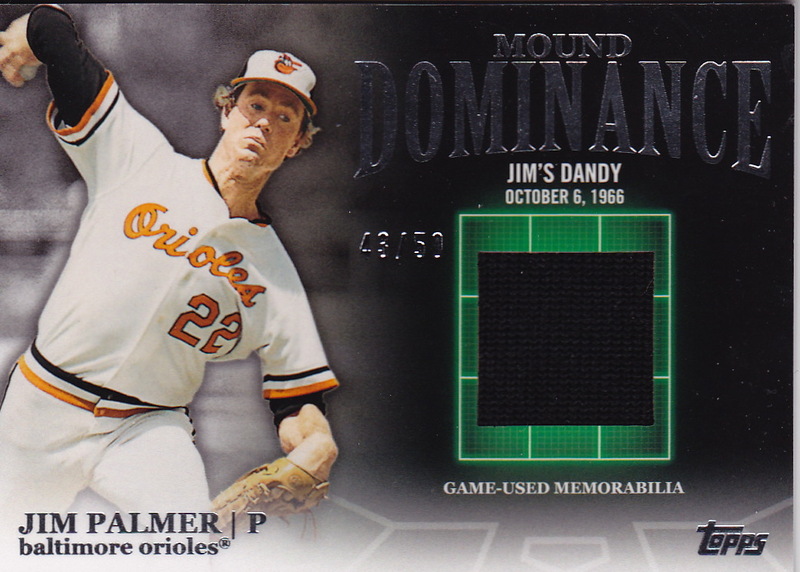 The 2nd hit I got was probably the best of the bunch – numbered out of 50 from a Hall of Fame pitcher, Jim Palmer. 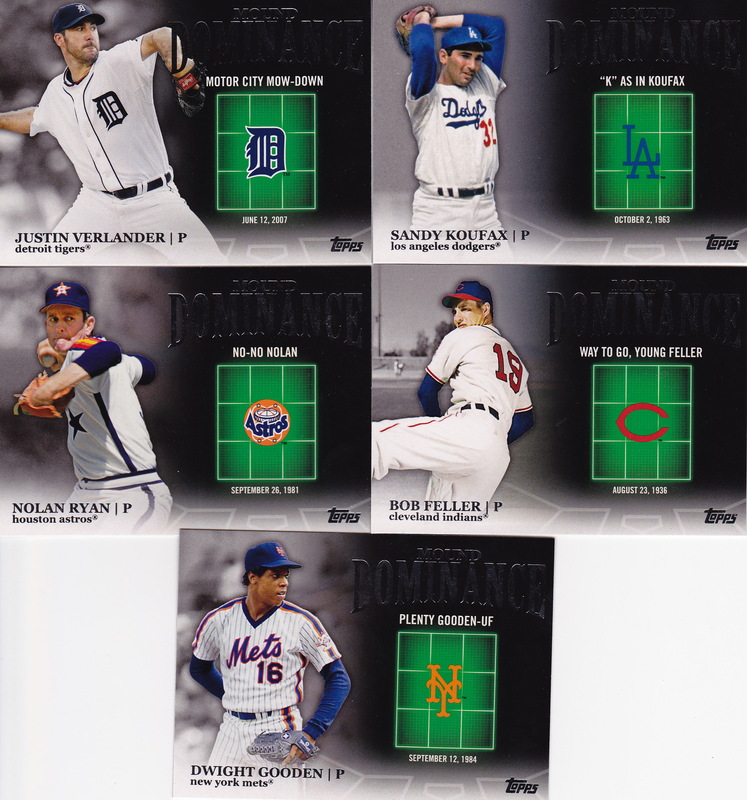 This comes from the Mound Dominance insert set that’s new in series 2. And, unlike the Coghlan, they seem to be picking much better moments to highlight. This one covers the 1966 World Series when a 20-year old Palmer outpitched Sandy Koufax in his first Series start. 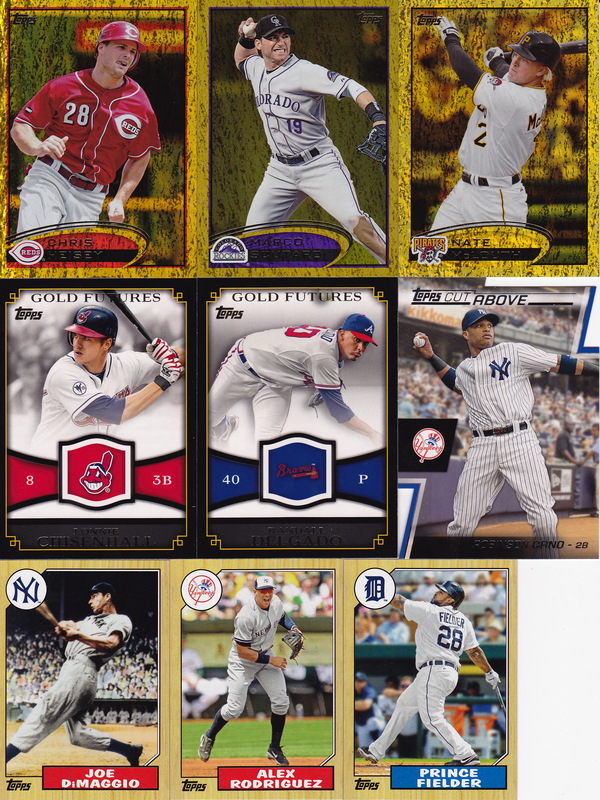 Greg the “Night Owl” recently sent me some cards as part of a trade we had (my 25th trade of 2012!). I sent him some Dodger cards, he sent me quite a bit more than I was expecting in return! I’ve got to start off with some cards that go with the point of this blog. 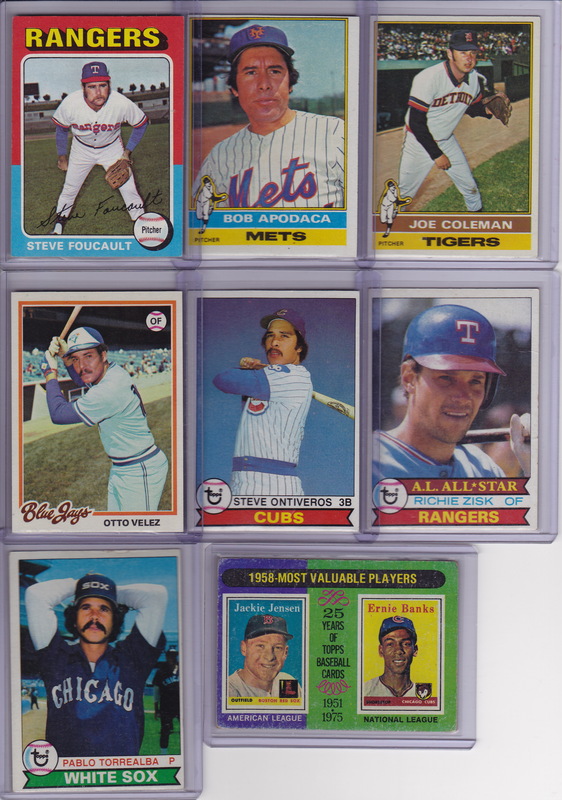 Despite the fact that I’ve been in a Retro haze the past 3 months, I do expect to get back to the base Topps collecting in the somewhat near future. I’m glad to get a smidge closer on 1994 Topps. Next up – Minis! I still wish this year’s Topps design had some kind of fake wood border. The 7-year old me is disappointed. Well, the 12-year old. 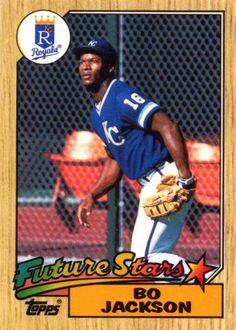 I collected cards in 1987, and I loved these, but I probably didn’t know that this was a throwback to the 1962 design. I did know this fact in my second collecting phase (1993-1996). If I knew two things back in the mid 90’s, I knew that 2012 Topps would have wood borders, and I knew that Ken Griffey Jr. would break Hank Aaron’s home run record some day. The ’87 minis Topps created only partially ease my pain. Greg also sent me some inserts from this year’s Topps and last year’s Ginter. A lot of gold. The golden moments aren’t my favorites, but I don’t really dislike anything Topps did. One thing I can say about all of the insert sets below – they all have a theme and I am at least excited to do the completion post for them. Lastly, Greg sent a few cards from this year’s retro sets. That Cueto is a refractor – which seem to look really nice this year. And the Griffey In Action? Well that’s my favorite card of the lot! Thanks for the trade, Greg! Topps Archives has tons of Big Red Machine cards. It’s got Big Red Machines out the wazoo, BRM’s out the yin-yang! No guys from the 1990 World Series team however. I’ll do this set by set (ending with an overview of player by player). 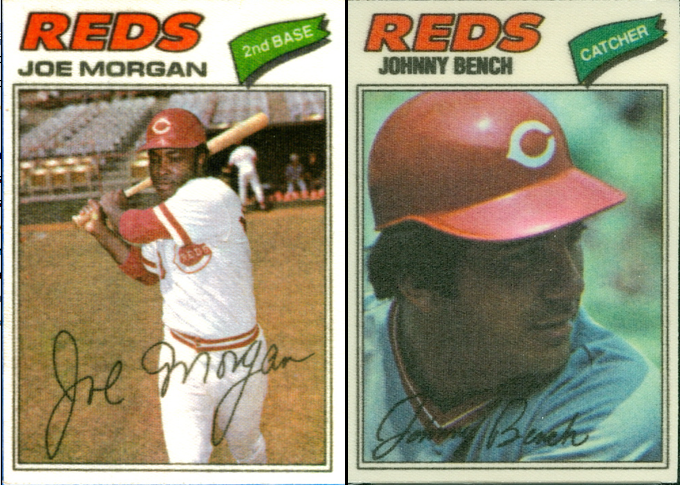 Despite 5 of the 9 Big Red Machine members being included in the product, there are actually only 2 guys in the Archives base set. 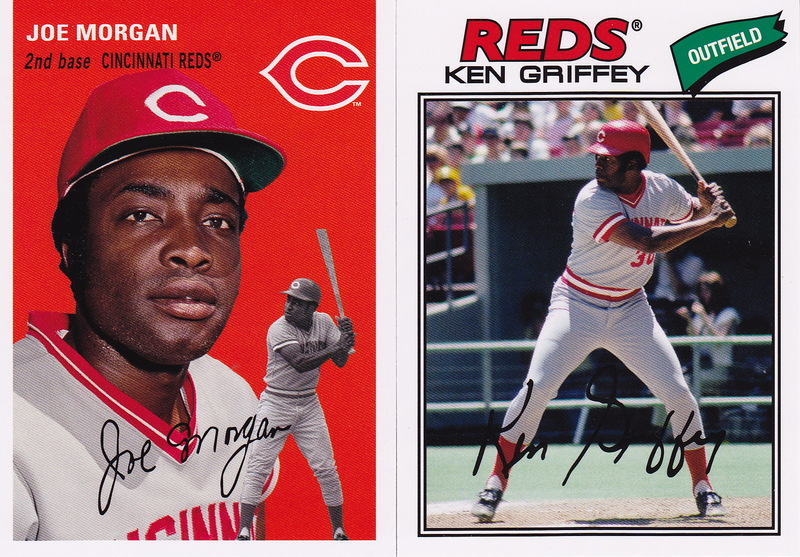 The first being Joe Morgan, who has a card in the 1954 subset, and the second being Ken Griffey Sr., who has a Fan Favorite SP on the 1977 design. 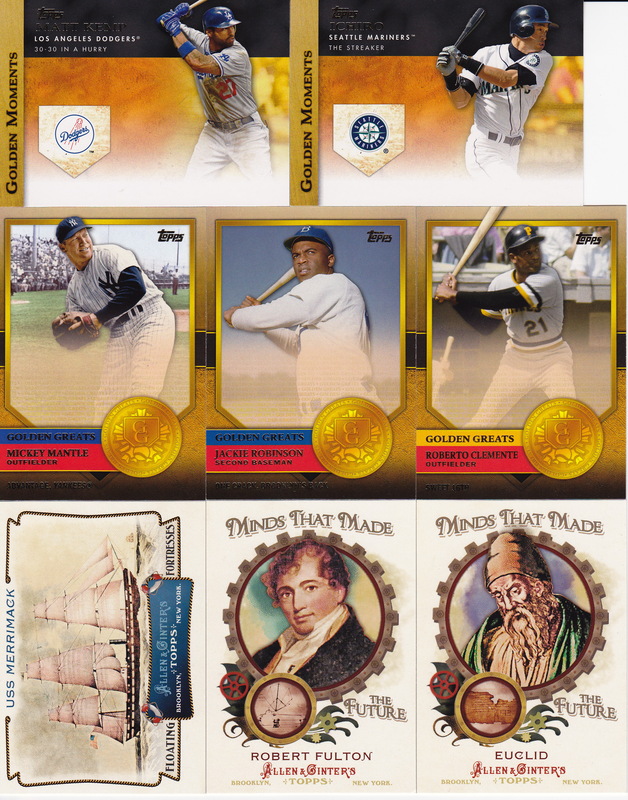 Topps only included parallels of the first 200 cards, so Morgan is the only player with a Gold parallel or a printing plate from the base cards. The SP card of Griffey Sr. from the 1977 design also appears in the autographed fan favorites. Additionally, George Foster is the 3rd Big Red Machine member in this product, as he has a Fan Favorite Auto from the 1978 design. The reprints bring it up to 5 BRM members, as Topps issued reprints of Sparky Anderson’s rookie card (1959 – from his playing days), the first single player card for Johnny Bench (1969). 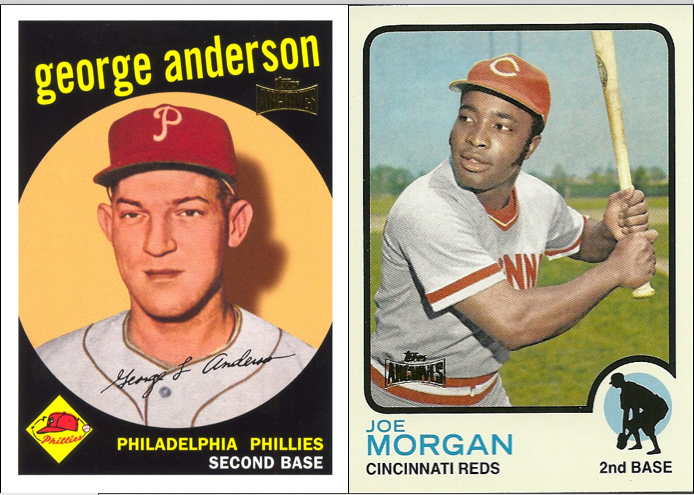 Additionally, Joe Morgan’s cards from 1967 and 1973 are included. Since there are printing plates for each of these, that’s 4 more cards with 4 printing plates #/1. 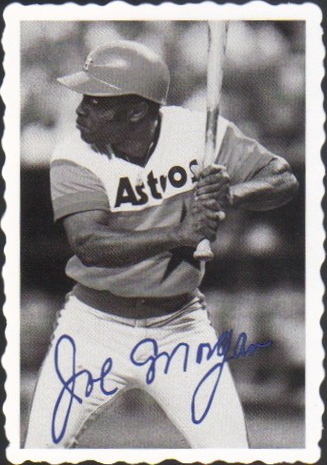 Joe Morgan didn’t have a Deckle Edge in the original 1969 set, but Topps gave him a card in this year’s Archives set. Unfortunately, they used a photo from his 1980 stint with Houston, not the stint from the late 1960’s from the era of this set. As with all inserts in this product, there’s 4 printing plates for this card, too. 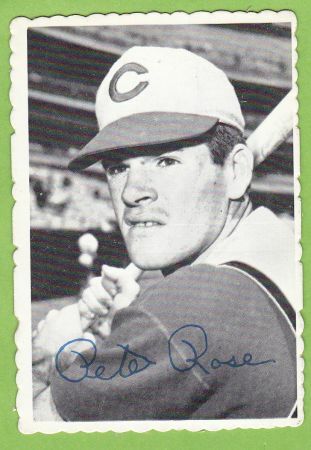 Original – Pete Rose was the only BRM-er with a card from the original Deckle Edge set. 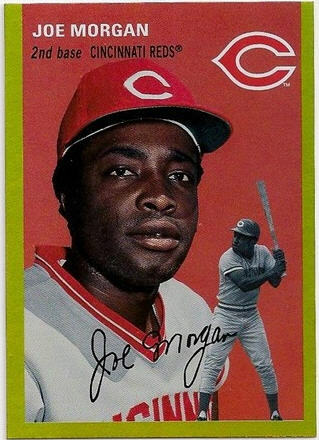 They definitely love Joe Morgan in this product – he and Bench both have a card in this insert set. This again means there are 2 more sets of printing plates out there. I found a picture of one of Bench’s from eBay – the printing on this one looks really beat up. 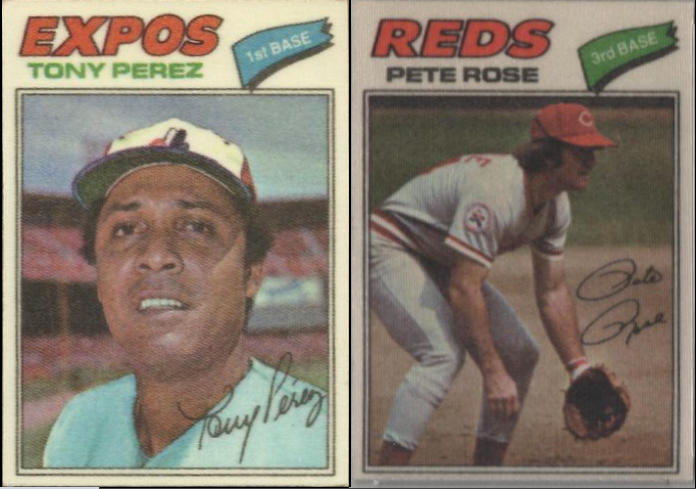 Original – Bench, Perez, Morgan, and Rose all have cards in the original 1977 Cloth Sticker set. 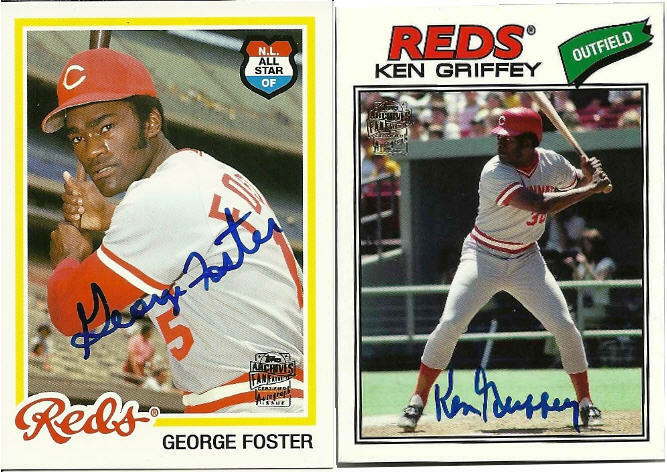 I’m kind of surprised Foster, who won the ’76 All-Star game MVP and was en route to smashing 52 homers and the the NL MVP at the time these were released. 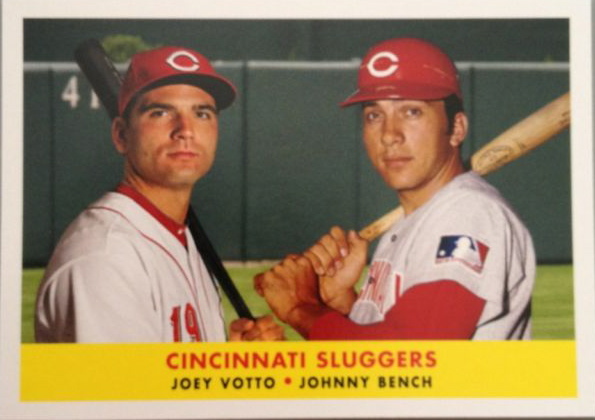 Topps matched Joey Votto up with Johnny Bench here. A good choice, I must say. There actually isn’t a printing plate inserted of these cards – they didn’t do this for the retail only inserts. 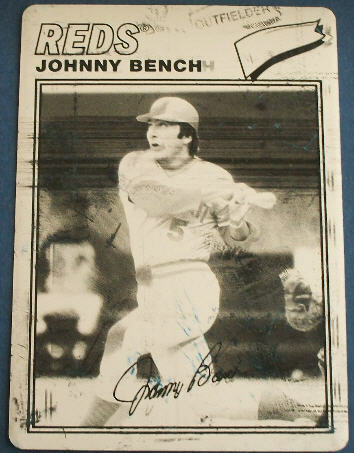 There is an exchange for a buyback autograph of a Johnny Bench original card. These were supposedly numbered out of 5. 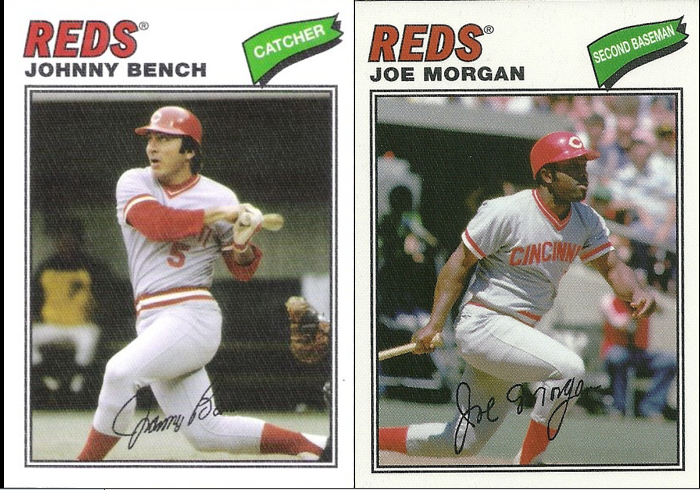 So, all told – if you wanted to collect every single Big Red Machine card I mentioned above, you’d have 46 cards to find. If you didn’t want the 1/1’s – that number would be 14, and if you didn’t want any parallel versions of cards, you’d have 13 (I’m not counting the relics of the cloth sticker as parallels, though you could make the argument they are).